Blue Sky Rentals is proud to offer Manitou Aurora and Sedona pontoon boats for your enjoyment! Rent a water trampoline today! The Aqua Jump 20 is guaranteed to provide summertime fun for kids of all ages! Rent a water trampoline from our beachfront location, or have it delivered to your lake. This water trampoline measures 20 feet across, with a 14 foot jump platform. All users are protected from the 96 high strength spring assembly by a thick, 19 inch wide pad, attached to the water trampoline. Jump platform capacity is 3 adults or 6 children (700 lbs. max.). Lounging capacity is 6 adults or 12 children (1,050 lbs. max.). Climbing aboard the 36 inch high water trampoline is easy with the five step stainless steel ladder. 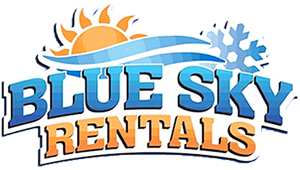 Below are the latest postings from the Blue Sky Rentals Page On Facebook.